WOW! 🙂 I can not believe it has been one year! On February 14th 2016, I decided to do something wild and crazy…love me! I decided to do what makes me happy and get myself back. I would often see others getting out there and doing their thing. I was a little envious. It must be great to know your God given talent and actually do it. I wanted to figure out where my talents lie. So, I tried a few things: baking, crocheting, and just making stuff. I was able to do it all; however, there was only one I LOVED. Making and crafting things! I always wanted to walk into Michael’s or somewhere and see people buying my stuff. Or designing some of those amazing stamp sets. How cool would that be?! So, Crafty Lotus was born! 11 posts published with 409 views, 262 visitors and 35 countries! That is AMAZING for MY 1st year. 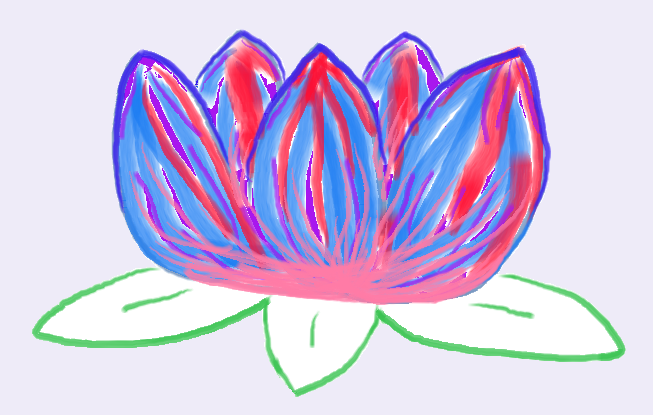 Thank you to every- and anyone who has stopped and visited my blog, Crafty Lotus. It has been a great year. I am looking forward to many more! It’s that time of the year when we all make resolutions to do something/anything positive for the new year. Then a few months into the new year, we say “Forget it. This is too much.” We’ve all done it. *Raises hand* I’m guilty of it too. Usually in life, if we intend on doing something…we do it. “I intend on going to the store/mall/party/work.” It, for the most part, gets done. So, this year we should be making the BEST intentions for our life/careers/blogs. Then be sure to put our attention towards making it happen. For me, what helps is to be able to physically SEE my intentions/goals. By writing it down, I’m able to visualize and focus on my goals/intentions. Therefore, being able to put my attention on my goals. 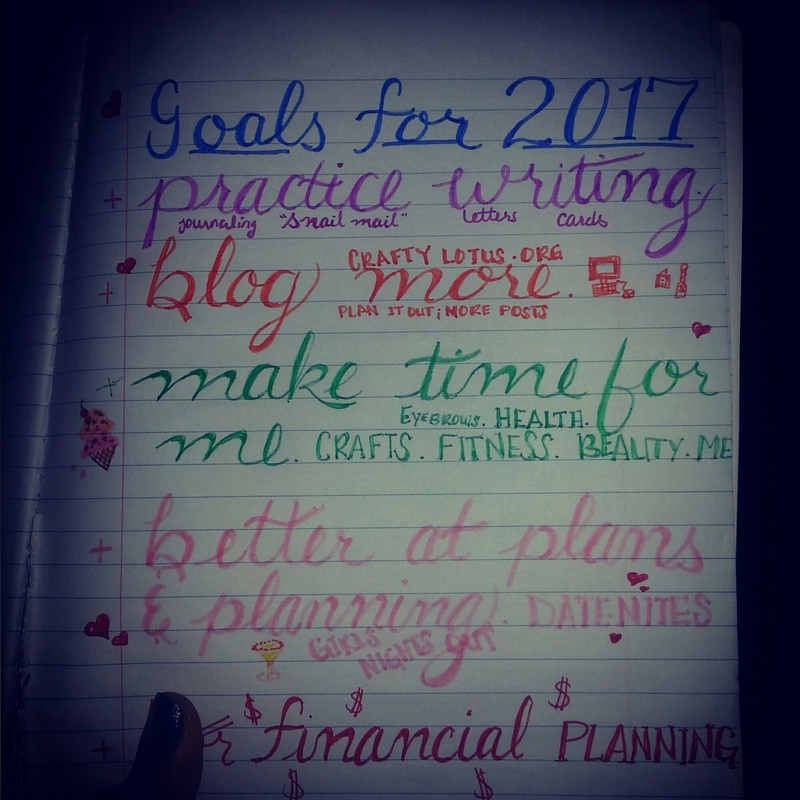 So, whatever your goal may be (more family time, get better at Copic coloring, learn new cardmaking techniques, etc), write it down and focus your attention towards it. Here’s to a more focused year.  Cheers! Until next time…Keep Crafting! As wedding season came around this year, a co-worker asked if I would create a wedding card for them. Of Course!!!! So, I thought of what I usually see when it comes to wedding cards…and did something different. All I saw were doves, rings, bouquets, black/white and bells. I did, however, see something that sparked my interest-the use of ribbon to make a train of a bridal gown. “That’s cool”, I thought. So, I went from there. I started creating the bride first. I thought she would be the most challenging. I went with a mermaid style dress. I mean who doesn’t love a good curve hugging/creating kind of dress?! I sure do. That was the style of my dress. Using the white satin ribbon, I pleated the top of the dress to help create a lifelike bust. I ended up using a small flat iron to iron the pleats down and make them stay. Next, I began to wrap the ribbon around the silhouette to get that rushing affect. As I went, I made a stitch here and there to secure it in place. When I got to the bottom of the dress, I created some pick ups and stitched them as I went along as well. I really had to get my David’s Bridal on to type this portion of this post 😀 Now, what’s a bride without a little bling glam?! I gave her a belt using the sheer, white organza ribbon. I threw some rhinestones on the belt, and the dress, to help jazz it up. Doesn’t she just look amazing? Yaaassss!! On to the groom we go. The groom actually turned out to be more of a challenge than the bride. Since the silhouette that I chose had a bent arm, I had to try to create natural looking creases at the arm folds. Also, each part of the tux had to be made with a separate piece of material–8 pieces total, which includes 2 pieces for the white shirt. I took care to add “seams”, black buttons (rhinestones colored black) and a tie. I chose a blue tie because of the wedding colors. Bringing it all together. I put the bride and groom side by side. I noticed that the bride needed something blue to kind of match her groom. I found some small beads that were close to the same color as the groom’s tie. I added one silver bead in the middle for a diamond look. But wait! What is a bride without a bouquet to hold? I used two petite swirl ribbon roses for the bouquet. I had to stitch them in place to make sure that they stay exactly where I wanted them. For the card placement, I originally wanted the couple to be placed next to each other. But due to the volume of the dress, the groom had to be placed slightly behind the bride. I used hot glue to secure them to the card base, Bazzill cardstock. I used their embossed cardstock, dotted swiss, in Sunset Rose. For the sentiment, I came up with something sweet to say. I then typed it up using a nice script font (in dark pink) and printed it onto the clear vellum. I adhered it to the card using a little clear glue. To complete the sentiment, I sprayed the interior of the card with some gloss and then quickly blew some ultra fine diamond glitter on to it. Wow! What a beautiful sparkle it gave the card. Not too much, just a dusting. Perfect! I created my basic black envelope from a heavyweight black construction paper. Well not quite basic. I had to make the envelope stretch. So, I made the sides of the card using an accordion fold. Then I used a gold paint pen to write “Mr. & Mrs. Walker” in my best brush script lettering. The card was a big HIT!!! Hello Everyone!!! I don’t know how your weather has been. But here in Maryland–we are really feeling Spring. Can we sing together, “Rain, rain go away.” I’m a little over all of this dreary, rainy weather. Silver lining…Flowers! They can be so beautiful. All of the bright colors really bring life to everything. This week is Staff/Teacher Appreciation week. It was suggested by the PTA, to have the students bring in flowers and cards to show our appreciation. So, I would like to give a big “Hip Hip Hooray” to all of the many teachers, professors and mentors all over the world. The ability to successfully and creatively mold minds, young and old, is a gift beyond measure. We salute you. You are truly appreciated. I really liked the idea of flowers for my young children’s teachers…especially since they are all women. (For me, giving flowers to a man is a little strange. Just me.) However, it was rather late when I actually remembered the flower part. So, you know what that means–time to get crafty! Paper flowers, here I come. After doing a little internet research, I decided on the hyacinth. They are bright in color and seemed to be the quickest to make. The supply list to create these wonderful flowers is so short-9 x 11 construction paper (green and any bright color), wooden skewers, glue and scissors. First, I covered the wooden skewer in green construction paper. While it was drying, I vertically cut my colorful paper into strips (3 strips per sheet). Next, I created fringe on the strips. Be sure to leave about a 1 cm/0.5 inch edge. Time to assemble the flower. Add glue to the uncut edge of your curly strip. Slowly wrap it around the skewer. Going too fast on this step will cause the paper to rip. Lastly, your flower needs some foliage. Cut a thick strip of green construction paper and then roll it up. Cut a little off of each side. Leave about a 1 cm/0.5 inch edge. You are trying to make it resemble a leaf. I used about 5 blades for each flower. Voila! Paper Hyacinth. All of the teachers absolutely loved them. This would also be cute for Mother’s Day or just any day. A great idea for someone who can not have real flowers (hospitals) but love them. HELLO WORLD!!!! I’m back. I know that it has been a long time since my last post. I just needed to take a break. I was exhausted and in need of a time out. With being a mom of 3, a wife and a new blogger–life was a little hectic. I wanted to make sure that I was posting something worth while on a regular basis (weekly to start). It became a little overwhelming. I was having some really late nights; which in turn led to late mornings. ¡No es bueno en absoluto! I decided to try to come up with some crafts that fit into my life. Before, I was just trying to craft and create anything. I think as a newbie blogger, you kind of have to do what fits in with your lifestyle. As you get further down that blogger road, you will be able come up with ideas to craft/create with less stress and worry. It will become easier…I hope. Now, I will take a look at the coming weeks ahead and see what bests fits. Even though I was taking a break from the blog, I was not on break from life. My kids were actually on their Spring Break. So, when there is no school, I try to keep them occupied with craftivities! We made Papier-mâché Easter eggs. The kids had so much fun making and smashing them (mini piñata meets baseball bat)! And I also made a shaker birthday card for my wonderful husband. Blogging this way should alleviate some of my blogging stress for now. I figure, over time this blogging thing will get easier and less stressful. I have to remember that I am still a newbie at this. As they say, Rome wasn’t built in a day. Have you had any blogging whoas or time management issues? Leave me a comment and let me know.